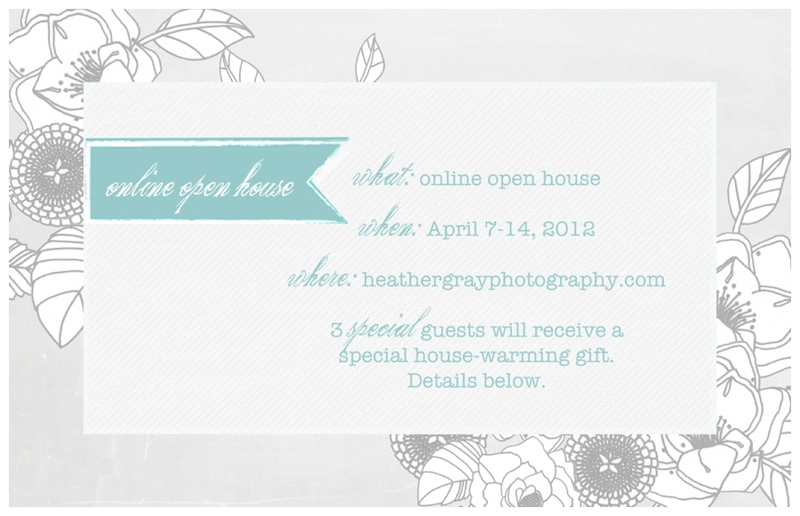 Our 3 winners chosen through a random number generator and announced April 15, 2012. 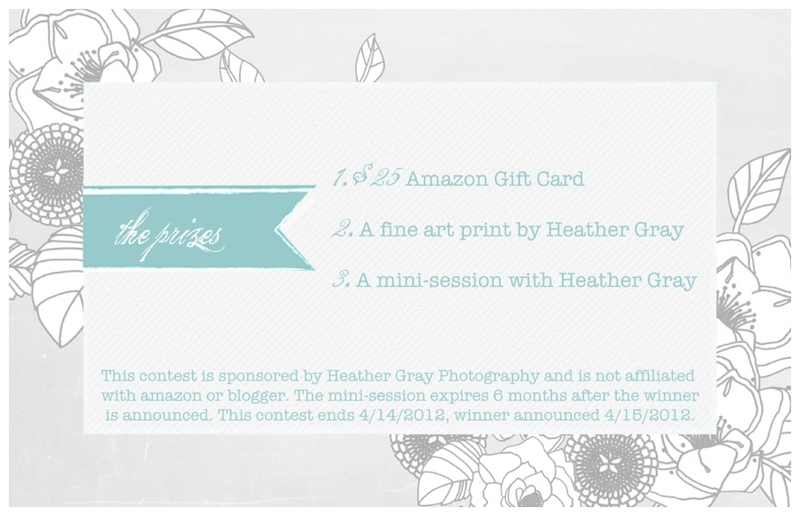 Please feel free to share this contest with your family and friends, the more the merrier. I love that you have a "Masters in loving life," it definitely shows through your work and that extra skip in your step. Your site looks fantastic, great work! I can't even pick a favorite beyond that. I like how the stories are shared! Looking at Lyndia and Leo's Forever Story brought me right back to that magical day... Thank you, Heather! I love your new website and how you describe each section. I especially love the portraits of Heather & Matt during Heather's pregnancy. The title is so adorable, and the photos are laid out in a wonderful way. Can't help that I'm a proud Grandma. You are so talented and sweet. Thank you again! Heather! I love everything about your website. I love your logo and the print along the sides (colors and fonts too). I love the titles of the sections ("love" "forever" and "cherish"). And, I especially love how much thought and consideration you put into every story. I can tell that you really care about the people that you take photos of and you put all your energy into translating their beauty. I'm excited to meet up in a couple of weeks! 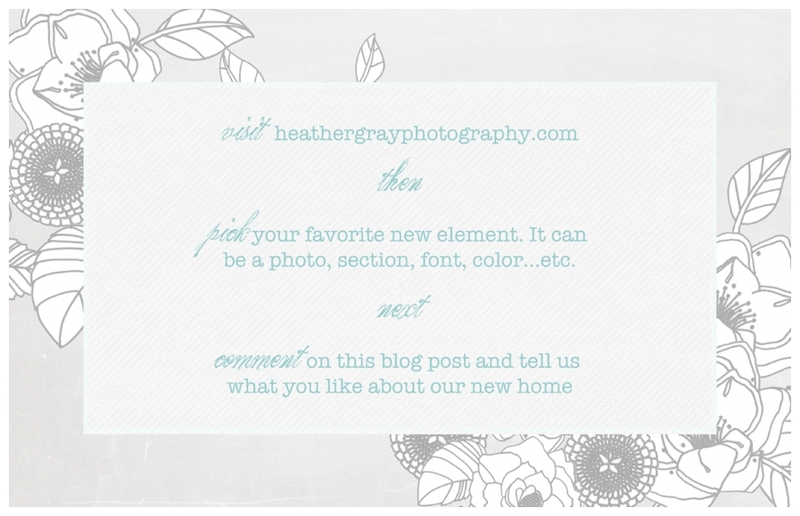 Heather, I love the color pallette! I love the flower illustrations and the little "Welcome to..." paragraphs at the top of each section. You have a talent for words AND images, it seems! I like the ninjas. Which there are at least 3 dozen ninjas on this website... but like true ninjas, they can't be seen with the naked eye. If you scroll up and down really, really fast though, then- just maybe -you can see one of the Heather Gray website ninjas. I like the pricing page with all of the photos for each package type. Very pretty and shows how you capture your subjects so well! Heather! This site is lovely and projects the warmth, class & love that I think of when I think of you. I love the titles of things ("love notes", especially) but my favorite of all is the Happy Plannings section, as I, too, love all things wedding related.. beautiful, beautiful job m'dear. (1) I love "Free Bird!!" (2) Love the gray-earth color background on your web pages that help make your color photographs appear almost as if they are paintings on museum walls. Very nice. (3) Love the short paragraphs under the groups of photographs. Not too much wording, but enough to add to the photos. (4) And I love the photograph of Heather Gray, Husband & son on the Oceano Sand Dunes, New Years Day 2012. It has a sci-fi look about it perhaps a sci-fi movie. There's an old movie titled "Last Man on Earth" with Vincent Price. This photograph would be the movie titled "Last Couple on Earth" and they have to start the whole thing over again, everyone else is gone. Judging by Heather's photograph, my money is on them - that they pull it off and the human race is saved - a second chance. 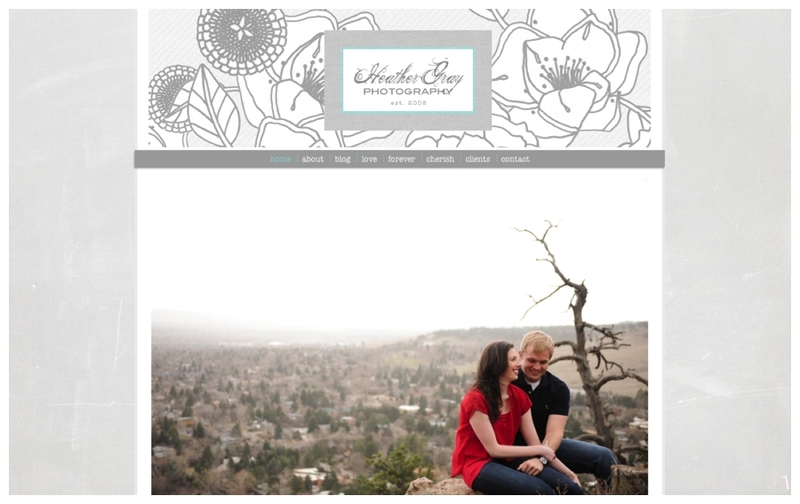 Love your new website Heather! I like the gray background color and light teal heading colors together. They are light and pretty, but not too bright so that your work can shine! Like it should! I also like the pricing page with examples of your work. I hope Ron and I can take some family photos with our future little ones with you someday! Jim! I love your perspective of my family photo. Especially the sci-fi side of it as we are total nerds with sci-fi things. The dunes always make me think of Stargate the movie, one of my favorites. We took this photo at the Oceano Sand Dunes, in Central Coast California, if you're ever in teh area, you should check it out. It's just North of the Guadalupe Dunes where "The Ten Commandments" was filmed. It's a really cool spot and there are still "artifacts" from the movie set buried in the dunes. I also wanted to thank you for your thoughtful comments. I love that you feel connected to the photos and can bring yourself into them. That is why I love to photograph dancers, to bring the audience in to another side of dance.